Pregnancy is indeed a beautiful and lovely phase of a woman's life. However, one has to take care of many things in order to keep serious problems and health issues at bay during this time. Precautions during pregnancy are a must so as to maintain the health of the would-be mother and the growing fetus. Generally, expecting ladies are advised to stay careful during their first trimester i.e. 1-3 months of pregnancy. This is the initial stage of fetus development and any slight issue can mar the development thereby leading to severe complications; especially if this happens to be your first pregnancy. Precautions during pregnancy can make it easy to live through the first trimester post which the risk level goes down. You must eat different types of foods (except the ones that are forbidden during pregnancy like papaya). The diet you have must be rich in all nutrients like proteins, vitamins, minerals, carbohydrates and also fats. There has to be a balance. If you are a vegetarian, eat loads of fresh fruits, veggies, pulses, legumes, nuts and whole grains. Non-vegetarians must include meat, eggs, fish and other poultry products. Your body at this stage requires immense calcium, which you should get from milk or other calcium rich food. You must consume around 600 ml of milk or milk products everyday. Getting the daily dose of vitamin D via foods such as egg yolks, fish liver oil, different fishes like herring, sardines, tuna, salmon, etc, fortified milk, or exposure to sunlight, is a must. Again, the vegetarians here must opt for sunlight or the prescribed vitamin D supplements. You must increase the intake of omega-3 fatty acids as they play a major role in the development of baby’s brain, nerve and the eyes. 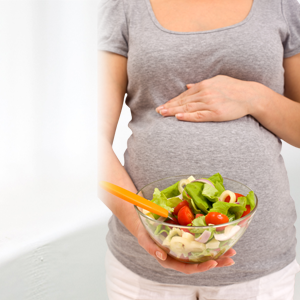 Eat smaller but frequent meals as the growing baby has to be fed constantly. You shouldn't eat in excess in one go. Divide your meals and eat in every 2-3 hours. You must increase the intake of fluid so as to boost the blood volume which facilitates oxygen and nutrient supply to both you and the baby. It's good to indulge in exercise during pregnancy. It helps in keeping the body fit and healthy. But do only the ones that are safe during this time. Your weight gain must be gradual. For the excellent growth of the baby, your weight gain in the first trimester should be around 0.5-2 kg. You must sleep well. The hormonal changes make you feel tired so to maintain the body energy, make sure to get enough sleep. You must eat iron and folic acid supplements as prescribed by the doctor. As these help in the spine and nerve cell development of the foetus. Be regular with your visits to the doctor. The prenatal check-ups let you know how the baby is developing in the womb and if there's any issue, it can be detected and solved on time. Don't take any medication unless prescribed by the doctor. Don't experiment with food, stick to the healthy and balanced diet. Avoid junk foods completely . Don't expose yourself to the environmental pollutants. Don't smoke, both passive and active smoking during pregnancy can increase the risk of health problems in the baby. Don't drink alcohol as it can impair your baby's mental and physical development. Don’t get stressed, or depressed as it can increase the risk of miscarriage. Don’t go on diet when pregnant. This can cause deficiency of iron, vitamins, folic acid, and minerals thus potentially harming you and the baby. If you can abide by these Dos and Don'ts during the pregnancy phase, you will certainly have a healthy baby. Precautions during pregnancy are a must and shouldn't be compromised with at any cost.